Grocery stores seem to bring out the weirdest sides of people and it’s a scary place to go alone. You never know who you might meet the second you turn down the aisle and they could be a strange character indeed. 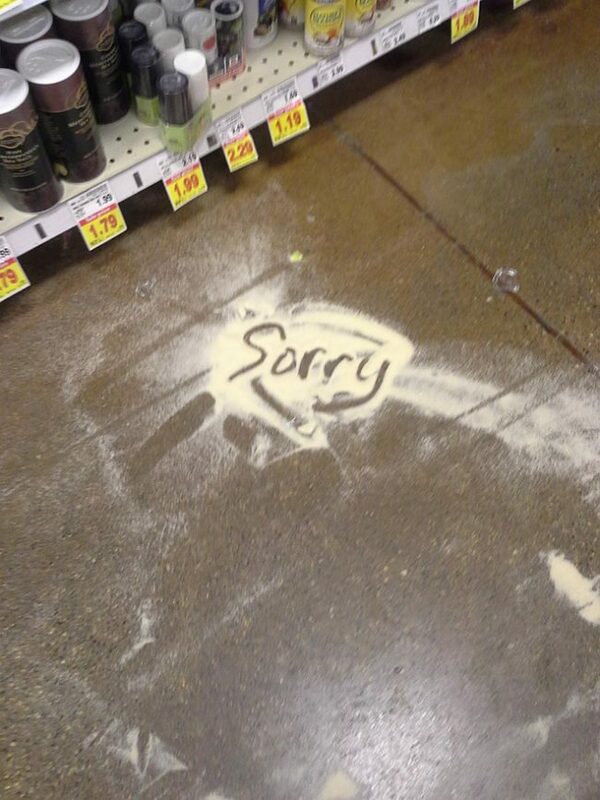 The following pictures might make you scared of grocery stores and people…sorry. 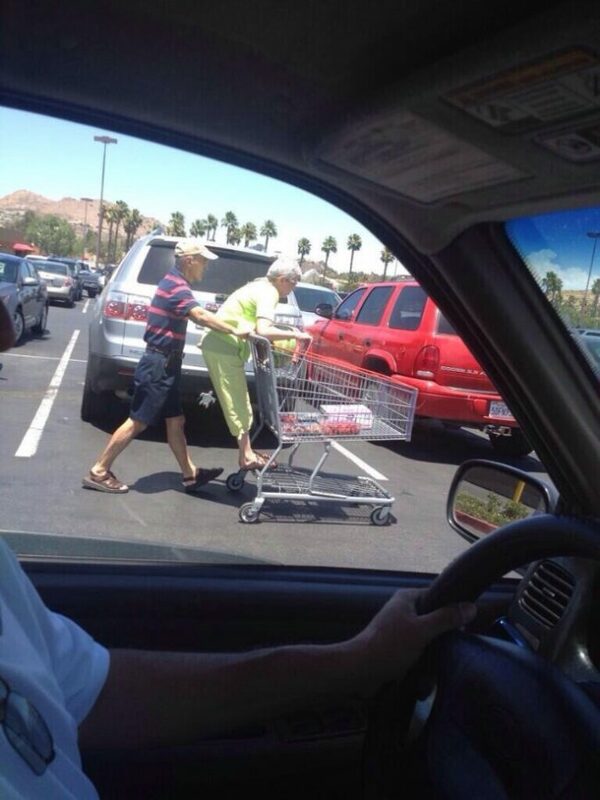 This couple doesn’t care how old they are, they can still push each other around on the trolley! Even though it’s sweet, I don’t understand why neither of them looks like they are having much fun. It’s the most serious trolley ride I’ve ever witnessed. 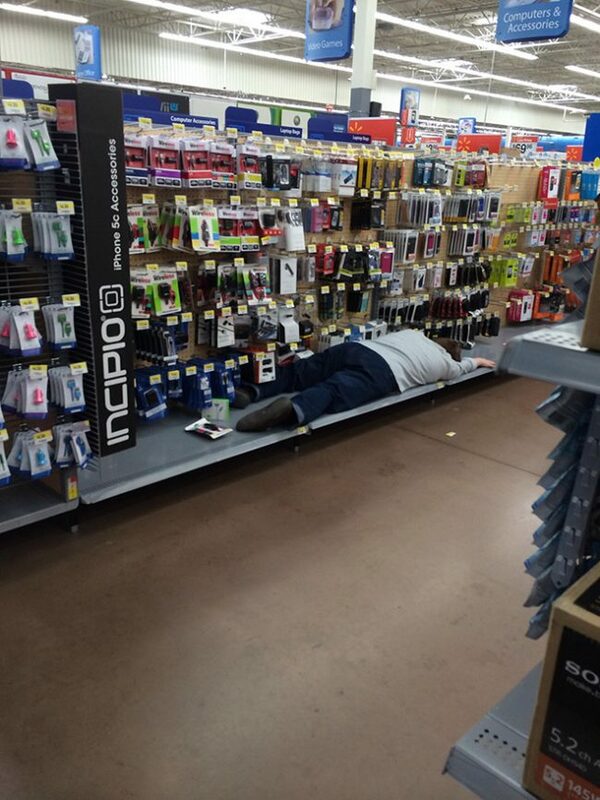 This guy is completely bored and done with life. 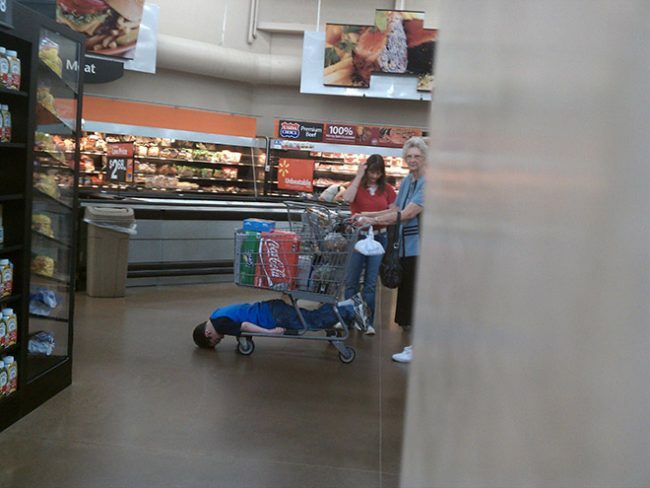 Either that or he has fallen asleep or worse…someone should check if he’s okay. I must admit, stationary produces a similar reaction within me too. Okay, this is the weirdest thing I have ever seen in my life. Firstly, that’s a GOAT. 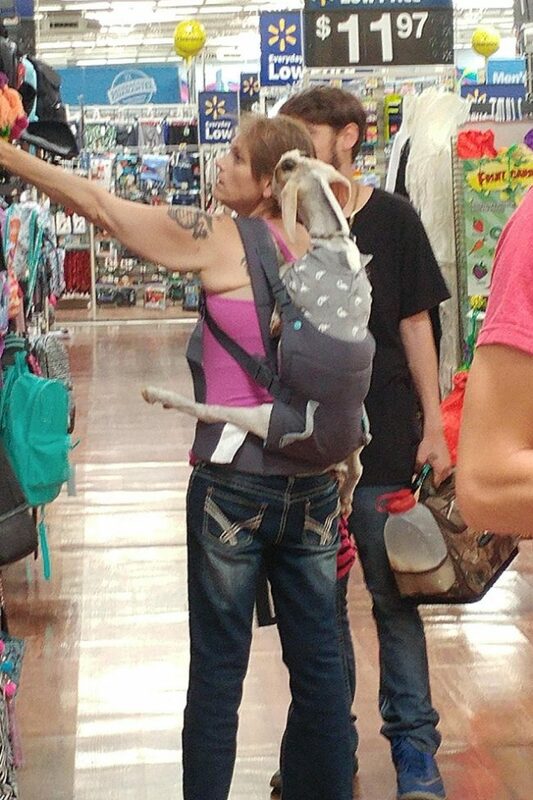 Secondly, the goat is in a baby carrier. Thirdly, the goat is licking her. Fourthly, that’s a GOAT. What is wrong with this woman?! Who takes their pet goat to the grocery store?! Help her. 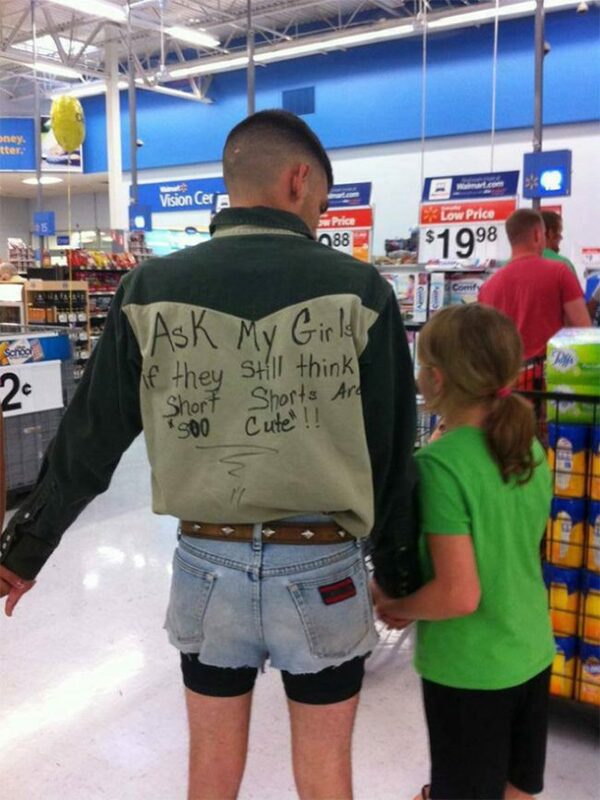 That’s a way to teach your kids to simultaneously both hate you and short shorts. I’ve concluded this dad definitely is weird, not only did he ruin a pair of jeans but he also ruining his jacket by writing on it in Sharpie. Who does that?! 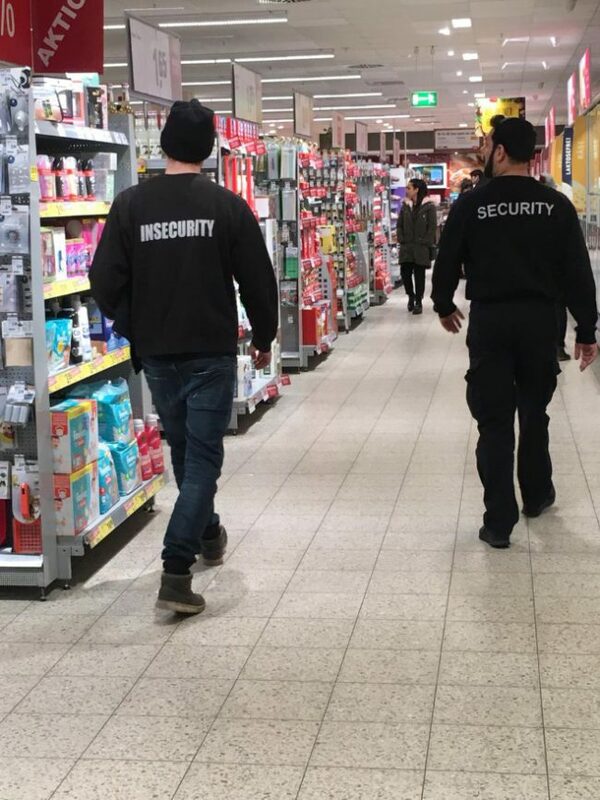 Who knew that security and insecurity could be best buds?! This warms my heart and I really hope that this wasn’t even intentional. 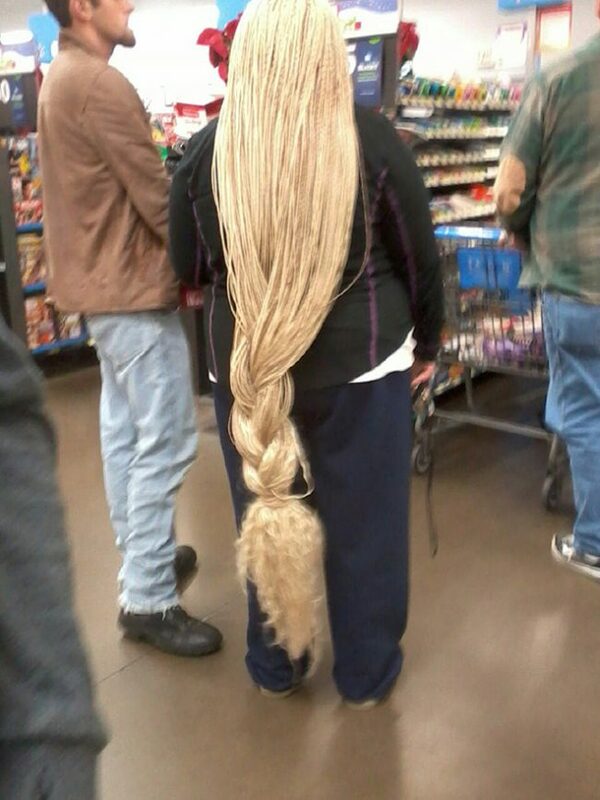 Honestly, I have no idea how this woman actually carries this amount of hair around on her head. How does it not give her neck pain and a constant headache? She is a strong woman. What’s with people going grocery shopping in their underwear. They look so casual about it, it’s not like they are even embarrassed. I’m incredibly concerned and scared. The hygiene side of things SURELY must be an issue, all of their parts practically hanging out around food. I can’t handle this! 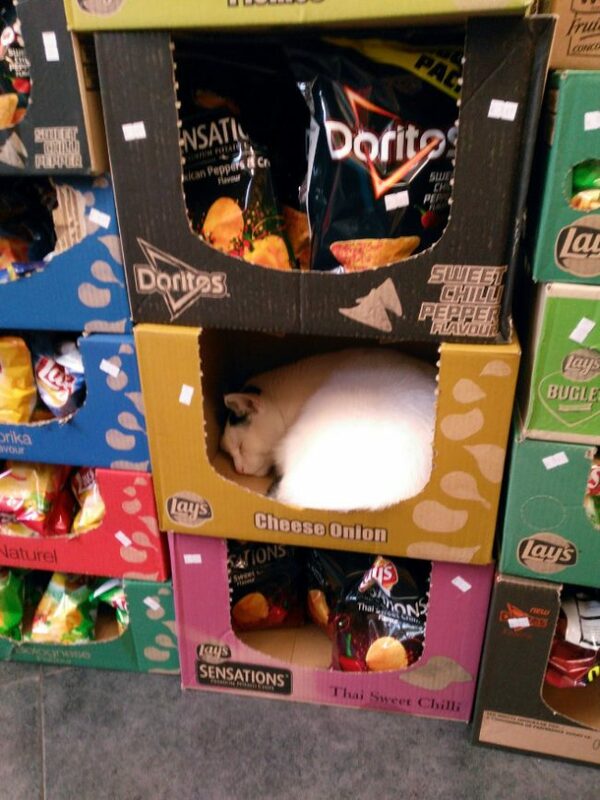 Can someone please tell me why there is a random sleeping cat in a grocery store? Can I buy her? Because I definitely would! Even the ANIMALS are weird in grocery stores. “I need to go to the grocery store. 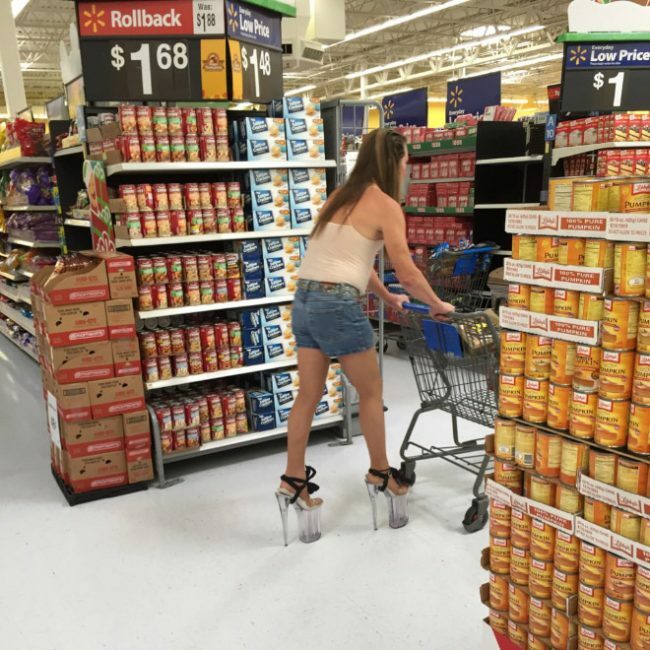 I KNOW, I’ll wear the highest, ugliest heels I own!” What was this woman’s logic? 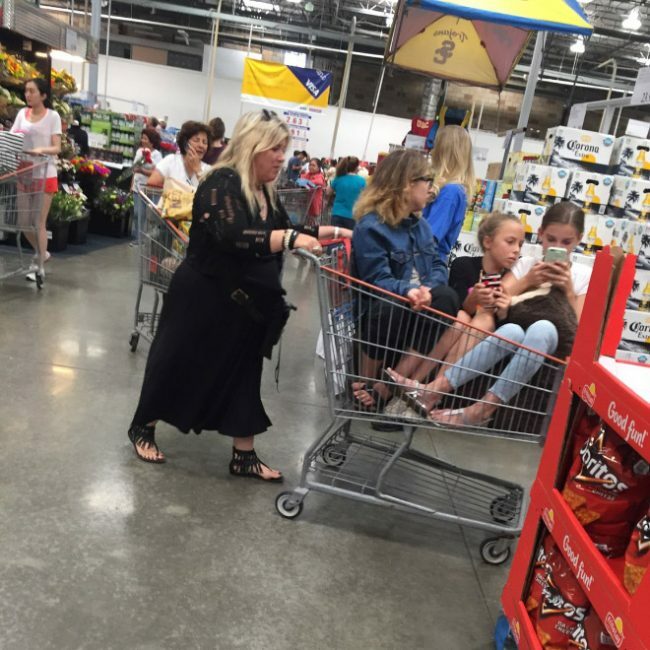 She looks like an absolute UNIT and is basically using her trolley to prop her up. 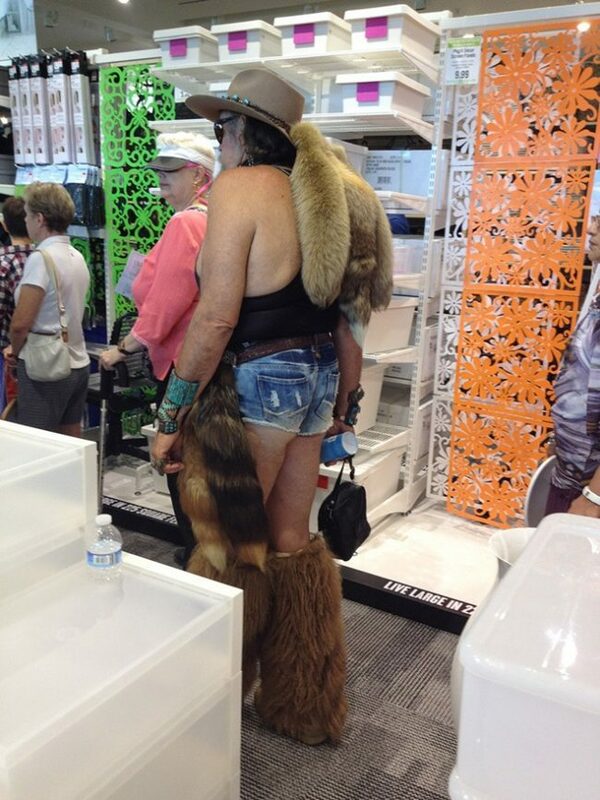 Bad clothing decision. 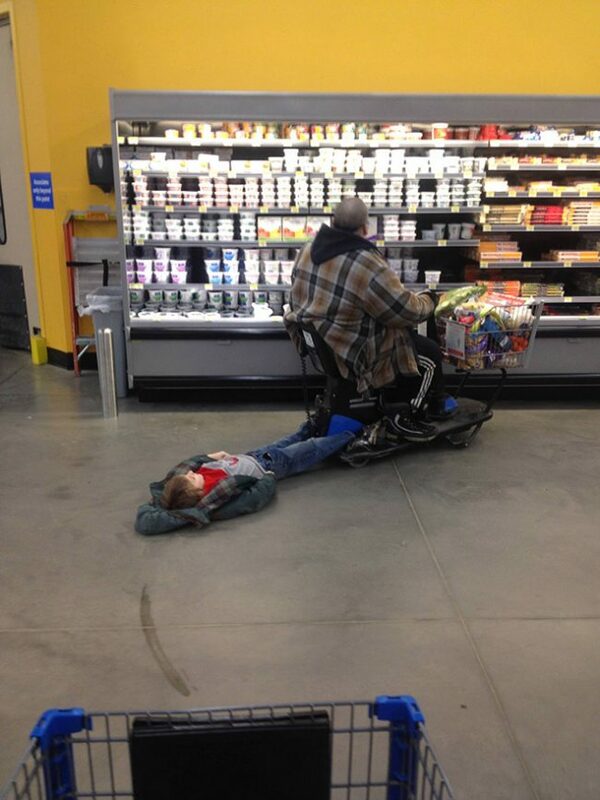 I’m not sure if this man knows that a child seems to be attached to his electric wheelchair. Or maybe he tied the child to that. Either way, at least the child gets a free ride! I hope that you haven’t been put off supermarkets for life, they really do seem to attract the strangest people you’ll ever meet. They may be unpredictable and scary but at least a trip to the supermarket might add some thrill to your day! Or, at least you’ll be guaranteed your daily dose of weirdness.